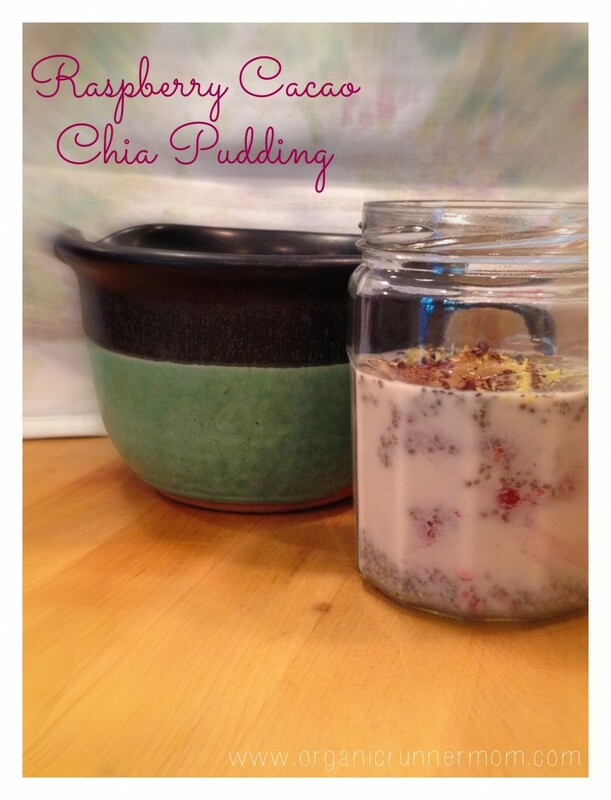 I was first introduced to Chia Seeds by Endurance Athlete and Sarah Stanley of the blog Inspired Living. Sarah eats a plant based diet and incorporates Chia into her food. Have you tried them before? They are a Superfood. They contain “healthy omega-3 fatty acids, carbohydrates, protein, fiber, antioxidants, and calcium” (WebMD). They come from desert plant Salvia hispanica. This plant can be found growing in Mexico. They have also been said to be a natural way to lower your blood pressure (please check with your physician). These seeds are perfect for adding into smoothies, sprinkling over your oatmeal or even adding to your water bottle for a workout! Another great way to use them are in a pudding which is actually quite easy to make. 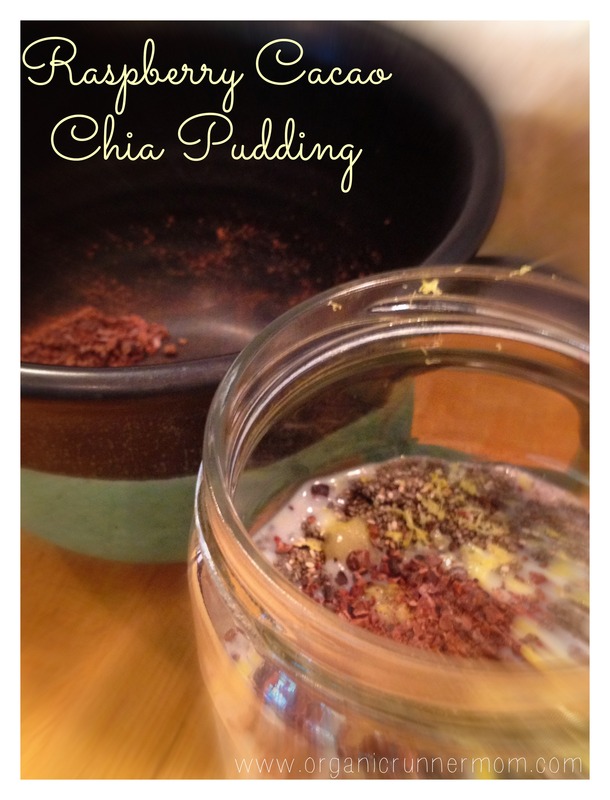 Here is my own take on Chia Pudding. Now let’s see what you think! Put 1/4 Cup of Raspberries in your jar (or other serving container) and mush to desired consistency, Add 1 Tablespoon of Cacao Powder to your jar. Next add 3 Tablespoons of Chia Seeds (this will create the pudding consistency). Then add 1 Cup of Almond Milk. Add 1 Tablespoon of Raw Honey (or more for preferred sweetness) and finally add some lemon zest for a bright clean taste. To combine ingredients, close the lid and shake until ingredients are combined. Place jar in refrigerator allowing Chia Seeds to expand as they absorb the almond milk. After about one hour your Raspberry Cacao Chia Pudding is ready to enjoy! My husband asked me if this recipe tastes good. He is a little unsure about the texture of the pudding. Although he likes eating healthy foods I am not sure he is a convert to my pudding yet! I think it tastes perfect. The pudding has a rich dark chocolate flavor from the cacao powder with bright flavors from the lemon zest and the raspberries. I did have to add a bit more honey in the end to sweeten it up a bit more but you can adjust the sweetness to your liking. This was a perfect afternoon snack and kept me feeling full until dinner! YUM! this looks fantastic! i love raspberries + chocolate! If you make it please let me know what you think! Do you have any chia pudding recipes? Sounds delicious to me! I’m a huge fan of chia seeds!